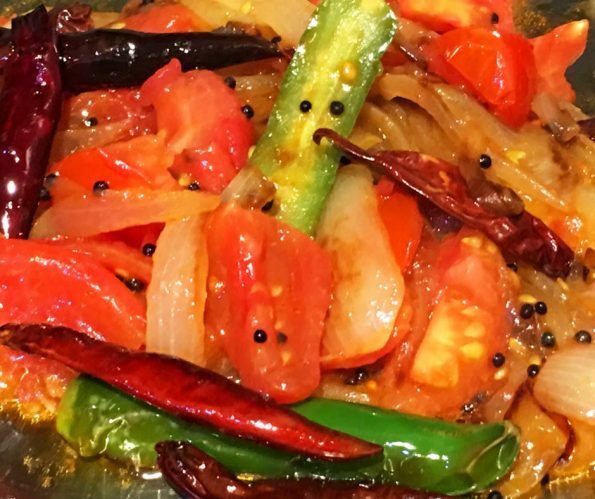 Tomato fry Kerala style recipe or tomato fry for chapathi Kerala style recipe is a very simple, easy and delicious tomato roast or tomato fry with onions and spices which is also quite spicy. You can adjust the spiciness, but this tomato fry tastes the best when its prepared spicy using both green chilies and dry red chilies. If you are looking for spicy tomato fry with gravy, see this easy recipe for spicy gravy using fresh tomatoes. This quick and easy tomato fry is kind of a dry onion tomato roast (see tomato onion curry with gravy here) which makes a great side dish for chapathi, poori, appam or idiyappam(Indian breakfast dishes) and it can also be used as a side dish with rice or dosa if you wish. As I mentioned above this is a very delicious and easy to prepare tomato fry dry curry recipe to make simple and quick tomato fry or tomato roast for chapathi and poori. Also this is a spicy tomato fry recipe, however if you wish you can reduce the spiciness by reducing the amount of chilies used in this recipe. This South Indian style fried tomato recipe is very easy to prepare and delicious too, you can quickly make this in very few minutes to enjoy it as a yummy side dish with chapathi or poori. This tomato fry for chapathi with onions and spices is a dry curry which means it is made without gravy and it is a Kerala style curry which is prepared without using coconut or coconut milk. I mention this specifically as many Kerala curry recipes uses grind coconut or coconut milk in its preparation or making. This dish is vegetarian/vegan as well and it is quite spicy in taste as we use red chilies and green chilies in its preparation, but if you don’t prefer it spicy you can avoid the chilies, ginger and black pepper if you wish. Tomato onion curry recipe with gravy is another easy and popular Kerala style recipe which too makes a great side dish for chapathi. The most simple tomato curry for chapathi is here which is made without onions and you can just make it so quick and easy. Simple onion curry recipe just uses onions & spices which too makes a very simple side dish for chapathi or poori. 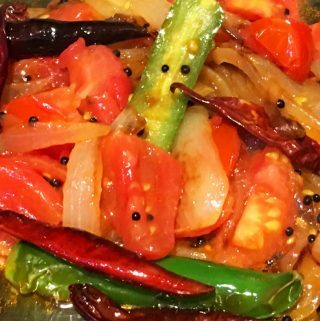 This tomato fry Kerala style recipe uses very few spices with regards to other Kerala style recipes or Indian style recipes (whethere South Idian style recipes or North Indian style recipes). The only thing that we may add to the dish is ground black pepper or powdered black pepper, which will add more flavor to the tomato fry. You can sprinkle the black pepper towards the end of the preparation of the dish or you can sprinkle the black pepper just for you while you are enjoying the dish. It is not necessary to add the black pepper to the whole dish, as whoever want the pepper can sprinkle it as they need it. You can keep table salt and pepper with this dish while you are serving this as a side dish with chapathi or rice as you wish. Other than black pepper, you will need only some freshly crushed or grated ginger and freshly crushed garlic (or minced or powdered garlic) to add flavor to this tomato fry Kerala style recipe. 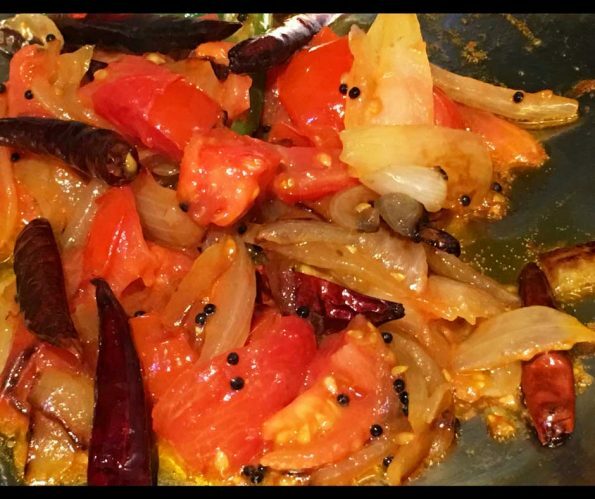 So here is how I made this tomato fry for chapathi following this simple, delicious and easy onion tomato fry Kerala style recipe. Tomato fry is a quick, easy and delicious South Indian Kerala style dish which you can enjoy as a side dish with chapathi, poori etc. 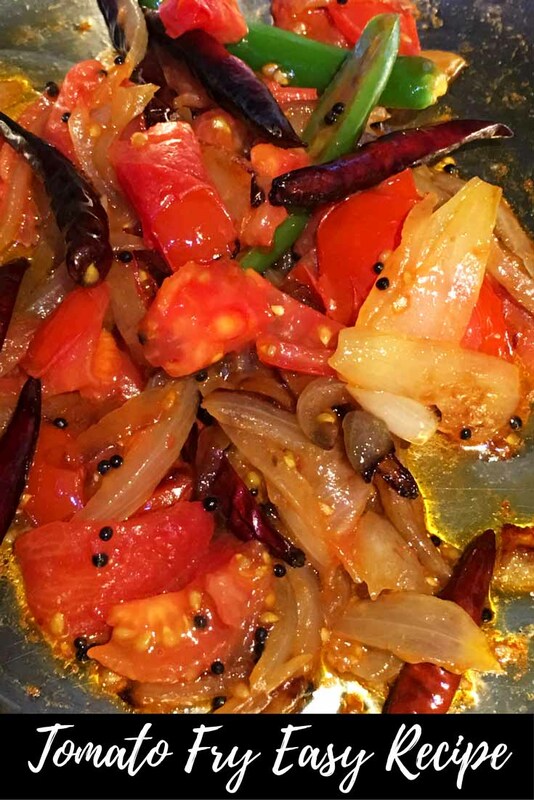 You can make this tomato fry spicy or you can make it mildly spicy if you wish. To make the tomato fry, first peel and slice the onions, keep aside. Chop the tomatoes in medium sized pieces (don't chop them into small pieces) and keep aside. Heat oil in a large pan and add mustard seeds. When the mustard seeds splutter, fry the red chilies and curry leaves for a few seconds. Add the sliced onions and saute for few minutes until the onions are transparent in color or lightly browned for best results. Add salt, ginger, garlic and sliced green chili, saute for another 1 more minute. Now add the chopped tomatoes and little more salt and mix everything well. Cook in low to medium heat for about 5 minutes or until the tomatoes are lightly cooked and the juice from the tomatoes start to come. We do not cook this dish more than this, as we need the dish to be a dry dish without gravy, so we just need the tomatoes to be cooked and we can stop cooking at this point. Add a little more oil to the dish if needed, stir everything gently and switch off the stove. Keep the pan away from heat we don't want the dish to be overcooked. Sprinkle the black pepper powder (if using) to make it more easy, or you can serve it as it is as a great side dish for chapathi, poori, appam, idiayappam or rice or dosa if you like! Tomato fry is very delicious when made using fresh tomatoes and green chilies which gives it a spicy and tangy flavor which goes great as a yummy and easy side dish with chapathi or poori. However if you don't want it spicy, you may adjust the spiciness by reducing or avoiding the chilies. Hope you found this post on tomato fry Kerala style recipe or tomato fry for chapathi and poori helpful in making easy and delicious tomato fry at home!